150 000 employees, the biggest center of the congresses of France. But it is also, the first center of Shopping of Europe with its 110 000 m ² of business in 4 Temps shopping galeries, renewed Cnit, 100 000 m ² of convenience store, it is the first shopping mall opened 7 days a week same on Sundays! 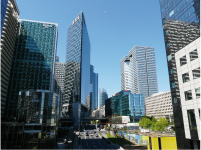 La Defense, it is a site where we work, and where we live, it is the site which covers already fifty years of architecture and which is in full evolution. The horizon of its revival. 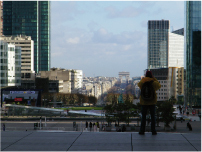 But today the La Defense it is also a full tourist Destination. Classified " tourist Zone " since January, 2009, more than 8 million tourists, already frequent it! That they are tourists of affair or enjoyment, they can spend a whole day of discovery and leisure activities in this pedestrian place which prolongs the historic axis which opens Paris on its future. That we judge it! La Defense It is the Big Arc, the Museum and its 60 sculptures monumental of contemporary art to be discovered, its shopping first leisure of the French, its walks on the Square, the esplanade of General de Gaulle or even still on his 11 hectares of green spaces or gardens. 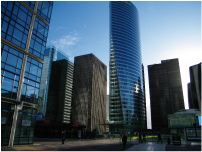 So the La Defense is not any more only the first European business district in a prestigious architectural frame. It is also the biggest district shopping of the Big Paris, a place of life and a rapidly growing tourist district. Tomorrow, with the architectural boldness of the new towers of big height and their concept of mixing (businesses, restaurants and hotel space), and also the Aréna the Stage- Show covered with 40 000 places, La Defense will be the district which we shall come to see. Imagined by the Hub agency, this new service is compatible with smartphones. It allows individuals exchanging services and communicating on events. Sous la plus grande voûte autoportante du monde vous découvrirez des salons et des congrès aux thématiques multiples au coeur du plus grand quartier d'affaires européen.